Gold hasn't done much either in the past few weeks and this morning is at $1672. Considering that FX spread betting markets have seen quite a bit of dollar weakness of late, it comes as a bit of a surprise not to have seen more strength in the precious metal. The bulls are finding it hard to get excited about the yellow brick after all the margin increases which led to the recent sharp correction to the downside. However, our spread betting account holders remain long on the whole, hoping for a return to the dizzy heights around the $1920 area. Gold rallied on the back of the Dollar weakness and even got to as high as $1690 before rejecting these dizzy heights and heading back to the mid $1670s. This morning the gold financial spread betting market is at $1674.0 and already we've seen fluctuations between $1680 and $1670. Slowly but surely the precious metal has been grinding higher since its sharp correction at the end of September in a bid to recapture the $1700 level. Having said that, the speed with which it has been moving higher is uncharacteristic and when you look at the daily candlestick chart it looks a little like a respite rally before the next leg down. Gold was not as favourable amongst investors yesterday as it turned in a little decline down to $1635. The precious metal is at $1670 this morning and so traders will be watching support and resistance levels closely seen at $1650/30/00 and $1685/1700/20 respectively. Brent recaptured the $110 level yesterday after an impressive bounce in line with equity markets. Despite OPEC cutting its forecast for global oil demand, crude oil prices are showing a bit of resilience with Brent at $110.80 this morning. Gold has been creeping gradually higher and is back around $1675. Following the retracement, the commodity has not enjoyed a similar return to the highs that it has in the past and goes some way to shroud the bulls in doubt about the longevity of gold's multi-year bull run. The long term upward trend is still very much in tact, however if the bulls can't retest the all time highs soon, momentum might just run out and we could test the recent lows again. Gold was clinging on to the back of world markets on Friday, as optimism took over once the Non Farm Payroll data had been released, showing a better than expected figure. Then, soon after the downgrade on Spain and Italy's credit rating, the precious metal lost its grip and plummeted, finally hitting the ground at $1637.6, after losing $11.8. At time of writing, the yellow brick has clawed back Fridays losses, and is trading up at $1659.8. The much needed improvement of 103,000 jobs in the labour market helped crude oil traders forget about the double downgrade in Europe, and offered some consolation that things might be getting better. Black gold finished the day up at $105.68 and, considering the stronger Dollar against the Euro and the slight decline in US equities, this was a pretty good result. Currently, Brent crude is continuing its rally, trading at $106.46. Gold's negative correlation with the US Dollar started to take its form again yesterday, finding direction from the general sentiment on the global economic outlook. Demand for the yellow metal could grow after yesterday's central bank manoeuvres. However, the fact that the advance was only $8.5 to $1650.0 on such significant news could show that there is still a heap of caution around. Currently, the gold spread betting market is still on the rise, trading at $1660.3. The energy spread betting markets look like they are jumping on the back of optimism in the equity markets and so crude oil spread betting prices are clawing back losses made last month. General census was that the ECB were seen to be making the right moves to deal with the ongoing debt crisis and, therefore, demand for the black stuff will not decline as had been initially feared. All eyes will be on the Non Farms later today to confirm this optimism though. With the commodity markets bouncing back and equity markets showing a good recovery, investors were keen to help push gold higher as the feel good factor took over the markets. The level of $1600.0 looks like it's in place to provide a good support for the yellow brick and the few attempts to break below this were brushed off. In the end, the precious metal rallied $16 to $1641.4, but still looks set for a period of consolidation within the $1600.0 - $1675.0 range. At time of writing, the gold spread trading market is sitting at $1646.3. The unexpected decline in crude oil inventories yesterday set the path for a rise in the black stuff's price. The fact it came in on the back of a drop in crude imports was of little importance to the bulls as the data was accompanied by the surprisingly better than expected initial jobless claim figure. To generously add to the rally was the rebound in equities, providing solid direction for the energy complex. The three session winning streak that has been helping gold claw back recent losses came to an end yesterday, with the yellow brick losing 36 Dollars, closing at $1624.1. As in previous sessions, it contradicted the negative correlation it has with the US Dollar, as Fed Chairman Ben Bernanke downplayed inflationary concerns, which in turn lessened the appeal of the precious metal as a hedge against rising prices. This morning things are quiet after dipping to as low as $1600 yesterday, but we're pretty much flat at $1625. Crude started off yesterday's session in the negative as Greek debt worries lingered. However, after Bernanke's speech, stating that he's determined to take extra action to boost the economic recovery, things started to look a bit rosier for crude oil traders. 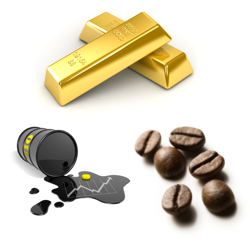 It's likely that the rebound in black gold was also helped by the sharp drop in the US Dollar and the rebound in the equity markets. At time of writing Brent crude is trading at $101.76. Gold's bounce back did not end yesterday as investors were still seen to be considering the precious metal a safety haven, buying in to protect themselves from the market limbo caused by a looming Greek default. As we saw in the previous session, the higher Dollar did not restrain the yellow brick from gaining $36 to close at $1660.0. Currently, the fact that gold is trading back at $1677.0 could mean that we are witnessing the resumption of a new rally after the recent correction wiped $300 off the metal's price. The dominating concern for crude oil yesterday was energy demand, and this sent the black stuff spiralling downwards. Even with the sparse bit of good news in the form of better than expected manufacturing activity, crude continued its slump. Only adding to the increasing weight was the higher US Dollar and the sell off in the shares spread betting markets. Things haven't changed much this morning, with Brent trading down at $100.82 a barrel at time of writing. As politicians twiddle their thumbs over finding a fix for the apparent Greek debt crisis, investors returned to the yellow brick as a hedge against the growing market turmoil. To add fuel to the fire, news that Eurozone inflation had reached 3% last month was not welcomed with open arms, and this spurred further demand for the gold spread betting market. So despite the strength in the US Dollar, which has lately been acting as a weight on gold's price, the yellow metal gained $6.8 to end at $1623.2. At time of writing things aren't slowing down as the rally continues to push gold up to $1649.0. The usual suspects were to blame for the sharp fall in the crude oil spread betting market. The weakening equity markets and strengthening Dollar joined forces to push the black gold down, possibly as positions were squared off ahead of the weekend. The slump was weighted further by the negative Eurozone inflation data and, at time of writing, things aren't any different as the liquid commodity sits at $101.76.